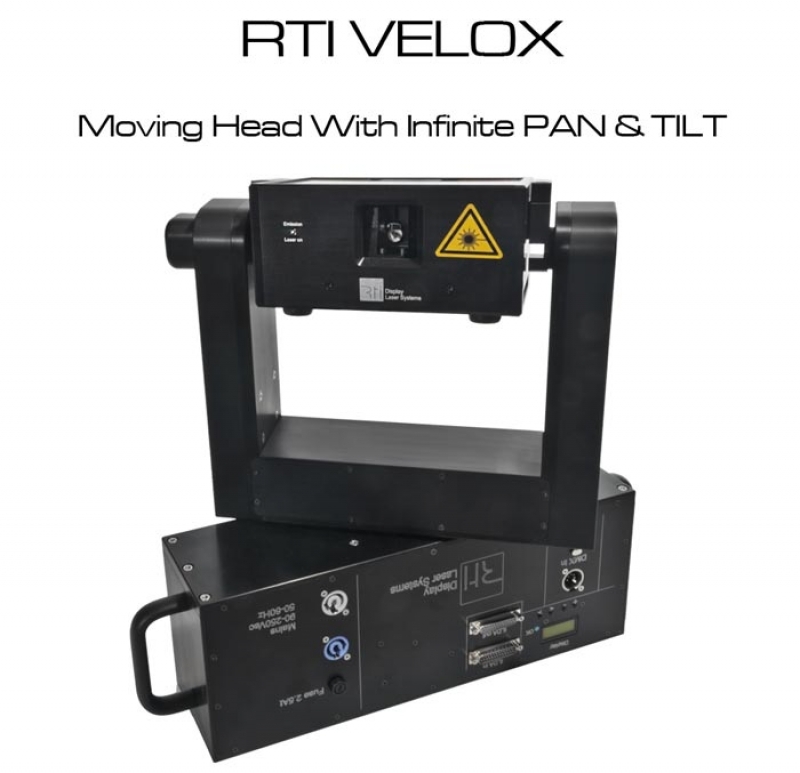 Lighting Designers, production and rental companies will love this new laser moving head: Different laser powers are available – from 1.7W RGB up to 14W RGB – and it does not require any laser operator or laser company: Just run the RTI VELOX like a normal moving light fixture! The RTI VELOX is initially presented as the RTI VELOX RGB 2.5 laser, but more versions will be available within the next weeks – with laser powers of up to 14W RGB. The extreme torque of 15Nm and the resulting high rotation speed of up to 180rpm make this unit the perfect gear for highly spectacular show productions and effects. Due to the high end laser system with great color balance and extremely fast scanners, a use for TV productions or high profile shows is no problem at all. The ILDA control signal can be fully used for laser control, and the VELOX moving yoke itself is controlled via the standard DMX512 protocol. A DMX-only operation is also possible. 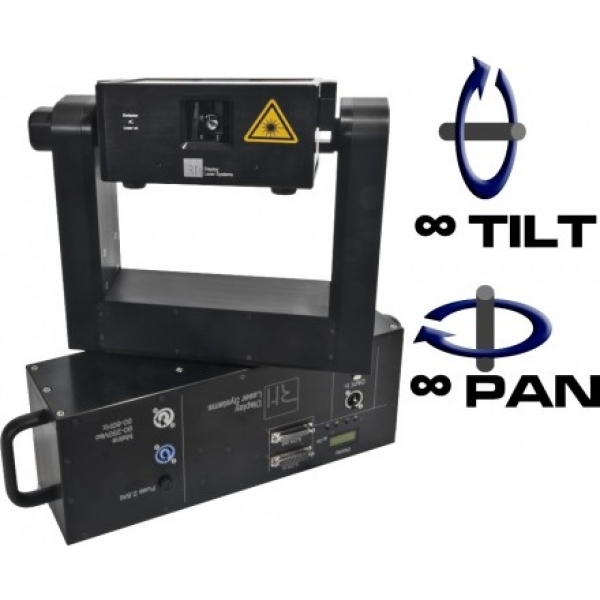 When a laser show system is moved on a yoke, it is absolutely essential, that it repositions accurately – for safety reasons and for correctly hitting beam targets. 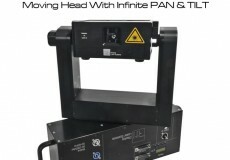 Therefore the RTI VELOX Laser Moving Heads have an absolute positioning accuracy of 0.022° per axis. As size definitely matters, the RTI VELOX RGB 2.5 laser moving head has an extremely slim design, so that 8 units placed side by side only have a packaging length of less than one meter! This is another great benefit for production and touring companies, as the systems are so very small – despite their high power. The RTI VELOX moving yoke is completely Made in Germany, so is the RTI ATTO RGB 2.5, which is part of the VELOX RGB 2.5 laser moving head system. The enclosure is built of rugged anodized aluminum, which makes it extremely durable. Plastic parts are neither used for the yoke nor for the base housing. Especially lighting designers and professional show and production companies benefit from these completely new possibilities of using lasers in a show. The ease of use combined with the infinite rotation feature and the super accurate positioning allows the implementation of innovative show ideas that just haven’t been possible yet due to technical limitations.